Ok, some of you might remember a few months ago I was all ticked off because my bumpers and wheels were rusting. Well the dealer convinced me it was just stuff stuck to the wheels and left it at that. Now that its nice out I finally went today to clean the bumpers and some of it will not come out. Plus I look at the back side of the rear bumper and its totally rusty. It looks like they did not coat it at all. None of my other fords have this issue. My wheels have some rust on them also. Fronts are horrible looking because of all the brake dust sticking to them spotting them up. It looks like ish and Im ticked off. I did not pay $30,000 for my truck to look like a rusted POS in 7 months. I'm going back to the dealer this week, but what should I do, short of ripping there heads off? I want the rear bumper replaced and I want them to clean the ******* out of the wheels to get all the ish off them or I want those replaced also. thats why you take care of your vehcile. i work and i go to school and i some how make time in the winter to wash my truck. Dont give me this ish dude. I hardly drove the truck this winter and ran it through a car wash atleast once a week when I did. I have 5 other things at any time I can drive. I got this to tow with and thats about all I use it for. I just never had time to polish chrome in between the record 105.6 inches of snow this winter, working 50 hours a week running a company, and going back to college 4 nights a week trying to get another degree. Cleaning or not should not make two *****s of diffrence, its a new truck. None of my old trucks have this problem. As for pics. Its late and dark. Tommarow I might possibly be able to post some but I will be away all day tommarow. My bumpers and wheels did the same thing and my dealer told me the same story. I wash my truck at least once a week, winter or summer. It is a little annoying that surface rust appears unless you physically scrub the wheels and bumpers with a brush. I havent looked behind my bumpers in a long time so i guess i will do that tomorrow. Good luck getting the dealer to exchange your stuff, unless the rust is under the surface of the chrome. Last edited by 1 KRAZY KANUCK; 04-16-2005 at 05:01 PM. What is "ish"? Just curious. You mean it has a meaning? I thought he was misspelling *****. Same problem here. I have cleaned, used chrome polish and waxed them twice in a year but the rear bumper is rusting away. First new vehicle that's done this. But I have a feeling that it's the crap they put on the roads in winter they sware will not harm chrome. I'm not the only one having this happen. Still have a couple years of warrenty left so not to worried yet. 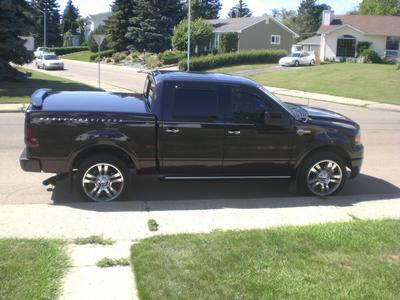 Dude, I'd be pissed to if I paid 30k for an XLT. Same problem here. The dealer told me it was metal pieces from the brake pads. So how does that explain the front bumper rusting. I think Ill take my truck in this week also. Ill update when it get a chance. dude, I paid freaking 33K for mine!! oh well, I gotta learn some day how to deal with these saleman....but ANYWAY......I have the same darn problem with rust on my rear chrome bumper. It's rusting on the edges, and the behind the bumper itself is rusting like no tomorrow! My truck has 4K on it now and 6 months old. I have not taken it to the dealer about the rust yet, I'm acually so sick of going to the dealers, I just need a break from them. I did not pay 30. I paid more like 28 but it does not matter, its still a crapload of money. Point of the matter is this is the first and only Ford I have ever had that had chrome rusting like this. Must be cheep chineese made crap. Oh, Sorry, no pics today. Trucks all muddy now from alittle bit of messing around I did down in Wellsville. This is primarily the reason why the FX4 is a far superior choice here gentlemen. No chrome....no rust. Plain and simple. Last edited by fx4scab; 04-16-2005 at 10:35 PM.